In the summer of 2015 the artist Lisa Alexander wrote this provocation for artists to respond to, for an event in Athens later that year: ‘Love Letters to a (Post)Europe’. Following the global financial crash of 2008, Greece’s economy was suffering and its membership of the European Union was under threat. Greek citizens faced the choice to leave the union or to suffer brutal austerity measures. The European project was under threat. The continent was at the mercy of unelected technocrats and economists. The people who caused the financial crash seemed to be controlling the terms of citizens’ suffering. Lisa’s provocation inspired an incredible festival of performance. Artists from all across Europe came together to explore what it means to love and live in a place you don’t always agree with. 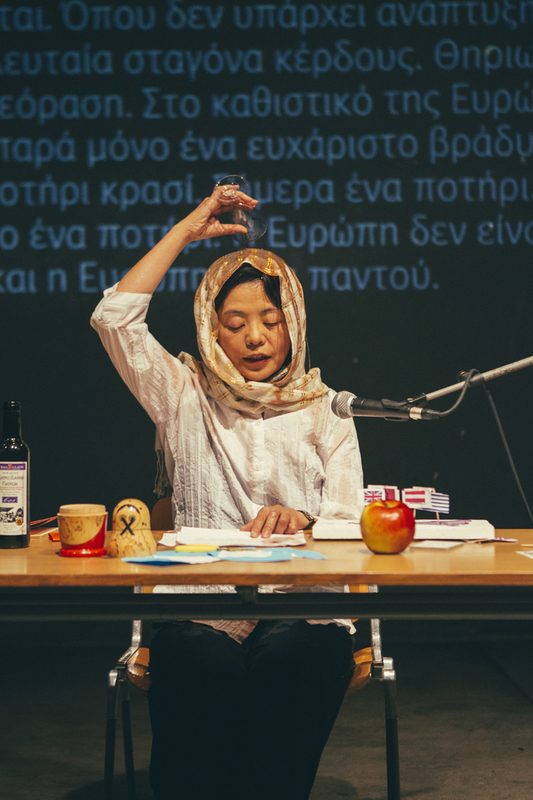 Love Letters to a (Post)Europe took place in Athens in October 2015. In 2018, Lisa Alexander wrote another provocation. The political moment had changed. She was writing from London, the financial capital of Europe, and the capital of a country that voted to leave the EU in 2016. The Brexit referendum was won on a platform of nationalism and anti-immigrant feeling. Lisa invited reflection and postscripts from the artists who came together in Greece in 2015, and an honest reappraisal of our roles in Europe. The result was a book that documents the entire journey: To You, To You, To You and a new festival of performance which took place in London almost exactly three years after the original. Responses by artists new to the project were performed alongside responses from the Athens event. Performance and gatherings also took place in the port towns of Liverpool and Folkestone and in Ormskirk. Hostile – host – hostel – shelter – welcome – gifting-giving – rituals of multiple exchange – a host of offerings etc. Lisa Alexander is an artist who works across the mediums of performance, text and installation. She also curates performance and writing. Her artwork and research explores the subjectivity of witnessing, artistic practice as a lens on social change or as a trigger for social imagination. Lisa’s work is informed by a prior training in dance. She was an Associated Researcher on Performance Matters (2010- 2012) and holds a PhD in performance and experimental poetics from University of Roehampton, London (2014) and a BA honours in Dance Theatre (Trinity LABAN, London scholarship 1996). Mary Paterson is a co-host of Something Other.